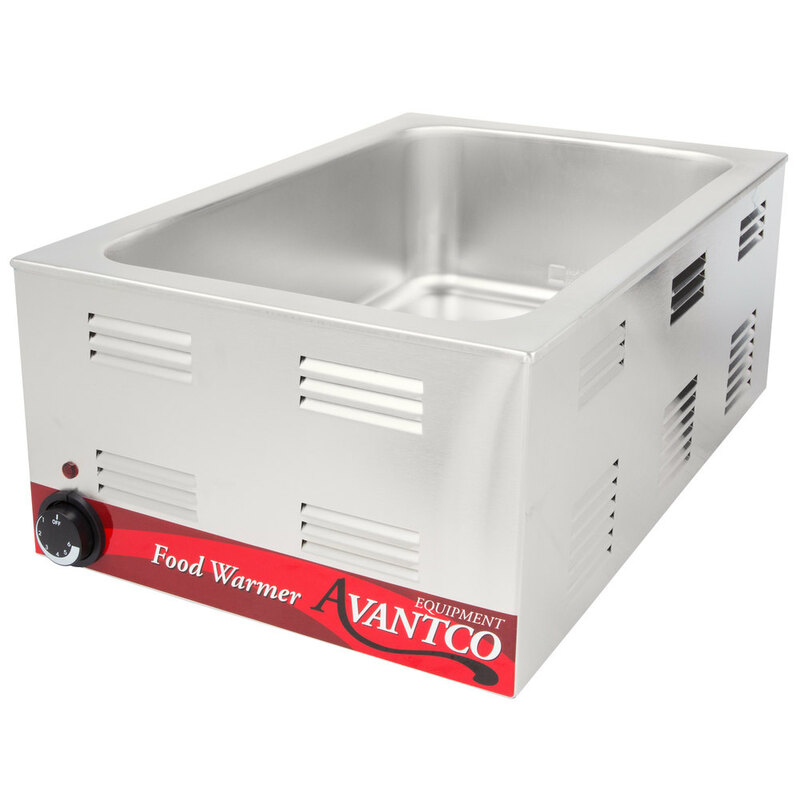 Keep your steamy vegetables, plump hot dogs, fluffy eggs, or sizzling bacon hot, safe, and ready to plate with this Avantco W50 12" x 20" countertop food warmer. Thanks to its specially designed internal heating elements, this countertop warmer holds your prepared foods at foodsafe temperatures for hours. It also has a heavy duty water well made of durable 20 gauge, 18/8 stainless steel to stand up to the daily demands of your busy concession stand, cafeteria, or hotel breakfast bar. For the price great item! We have had ours for over a year and we have had no problems. Would definitely recommend this item. Just wish it came with a sneeze guard. We love this piece of equipment. We use it to keep our quiche warm on one side and then oatmeal on the other side. It is always consistent always maintains the perfect temperature is not too big so if it’s conveniently on the end of our 3 foot prep table. Can't really complain too much about these as they are pretty cheap. They won't last forever, but they will last a while. Probably a few years. The knob is starting to get really sticky as grease gets in there and they're not very easy to clean. I wish there was a drain, but again you get what you pay for. The cord also started to fray pretty quickly. I highly recommend this food warmer, it's very convenient and my events were classy as I got a lot of compliments on these, I bought 3 of them and I never regret. Great products. It is lightweight, so it makes it easy to transport to where your event will be. Keeps your food hot and you’re able to fit many. The price is good as well. High quality design, Easy to use and great capacity. We use it for chocolate melting and very happy with the performance. Highly recommended to anyone. We have used this every day for 12 hours a day without any issues. We have probably had the unit for about a year now. Cant beat that price too. Tyler K. from Big Bun Inc.
First: Buy it ! This is an excellent value that has proved quite reliable in our shop. I have waited over 3 months of consistent use, in order to write a review that would include my experience over time. I am planning to purchase additional units, and this is the exact model that i will purchase without hesitation. Product arrived promptly and in good shape. Looks very nice to use in front of customers. Works great for keeping our soups warm. This is my second time purchasing this product. Would highly recommend. Great addition to our kitchen for getting the food out fast on our Sunday lunch menu. We use three of the unit every Sunday and they work great. This guy is a work horse. We've had it for over 2 years and we just it everyday with no issues. Excellent purchase! Thank-you Webstaurant! 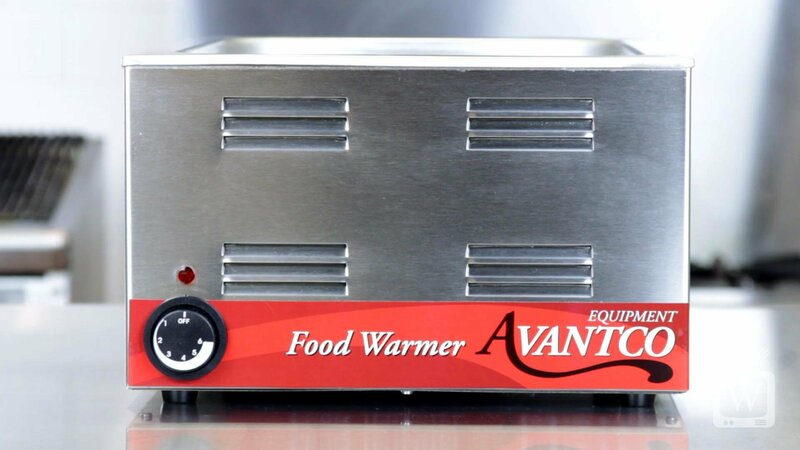 The Avantco W50 Warmers are great! have been using them in our catering business for over 2 years now. They work just as well today as they did when we purchased them. One thing I like about them is they are easy on the electric......a lot of warmers are power hogs these are not. Avantco W50. Es un producto compacto en tamaño; pero grande en eficiencia. Nos permite mantener nuestro producto fresco y con una apariencia professional y divertida a la vez. Recomendamos el producto y la marca Avantco en 100%. This is the best price you can not find anywhere else. Probably 3 times cheaper than any other brand. It does the same job with other expense ones. I really recommend this. These hold up wonderfully with daily use. Easy clean up. I bought one and tried it out. Bought 3 more. Not disappointed at all. Warm to temp super fast. We bought this to use as a tortilla chip warmer for our new Mexican restaurant and it works perfectly. No issues to report! I would definately recommend! This warmer is the most dependable warmer we've ever used. We keep two soup tureens in it and it keeps the heat so well. It takes a little while to warm up but once it is, you won't be disappointed. Fantastic work horse of a machine. 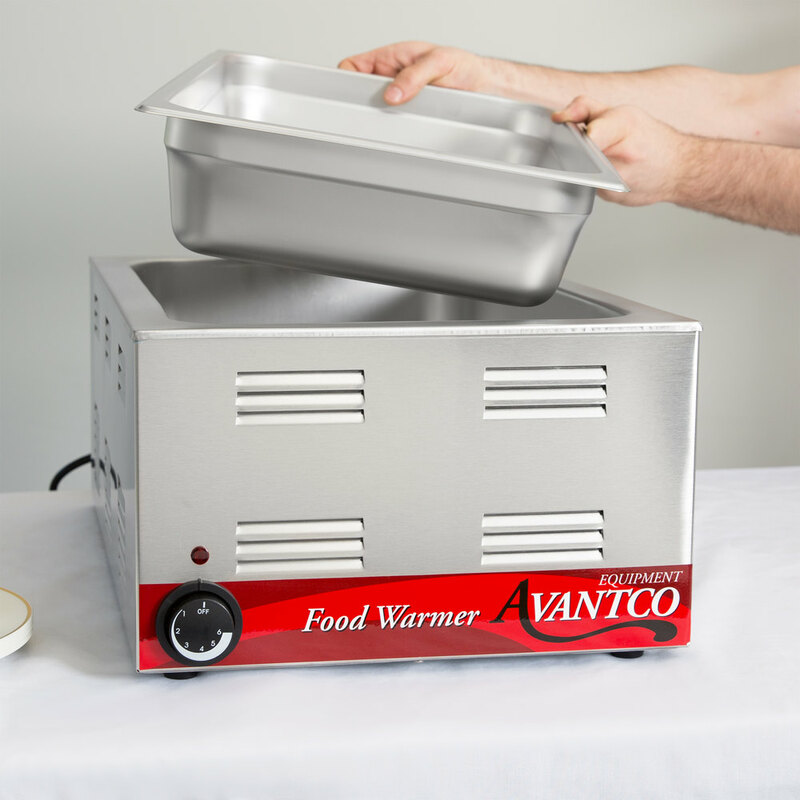 This is the most economical and durable food warmer on the market. This outlasts other warmers and keeps food warm. Will buy again, great buy. 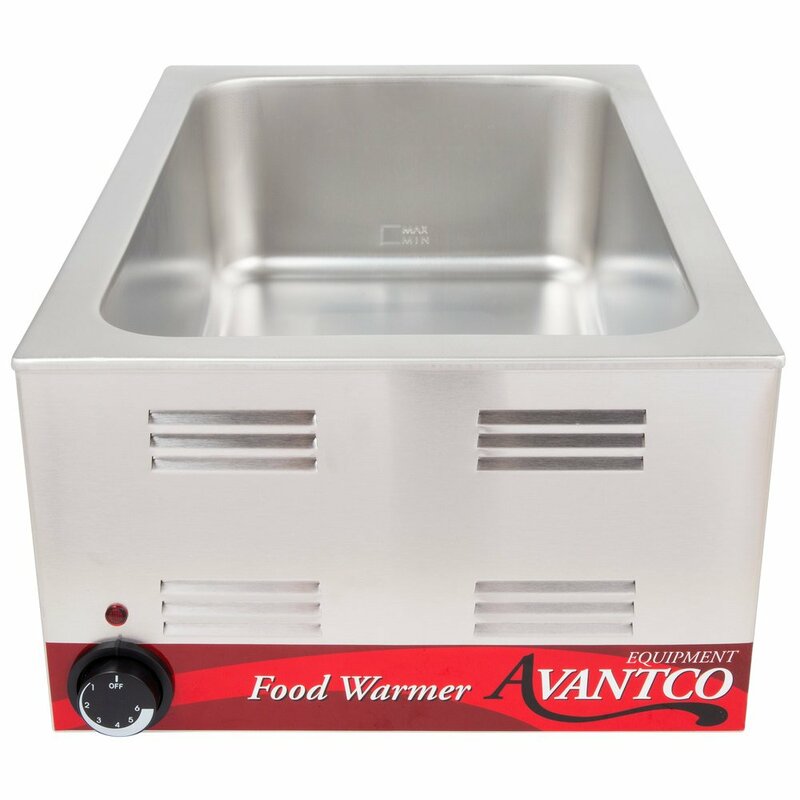 This food warmer exceeded all my expectations, it is huge and perfectly holds temperature. The water well is easy to clean and refill as needed. One of my granddaughters favorite things is to come over and dye yarn and rovings with Grandma. I use the Avantco W50 12X20 Full size electric countertop warmer steam set the beautiful colors. With the temperature control knob i can set the heat just right. I love this unit and have purchased 4 of them and multiple trays. I have 1 designated for food and the other 3 I use on almost a daily basis for my yarn business. Fantastic warmer. I use it for my pop-up kitchen and food stays hot for hours. Size is perfect for 3 narrow hotel pans, 6 square pans or 1 full. We love it. It is easy to clean and does not take up much table space a little less than half of a 4 foot folding table. Works like a charm and haven't had a problem yet. This was one of the cheaper models but it's already paid for itself and then some. We purchased 3 of these warmers and when I say the food stay hot!! It does for a very long time even after you turn them off. I ordered two of these units to keep gravies and side dishes warm. 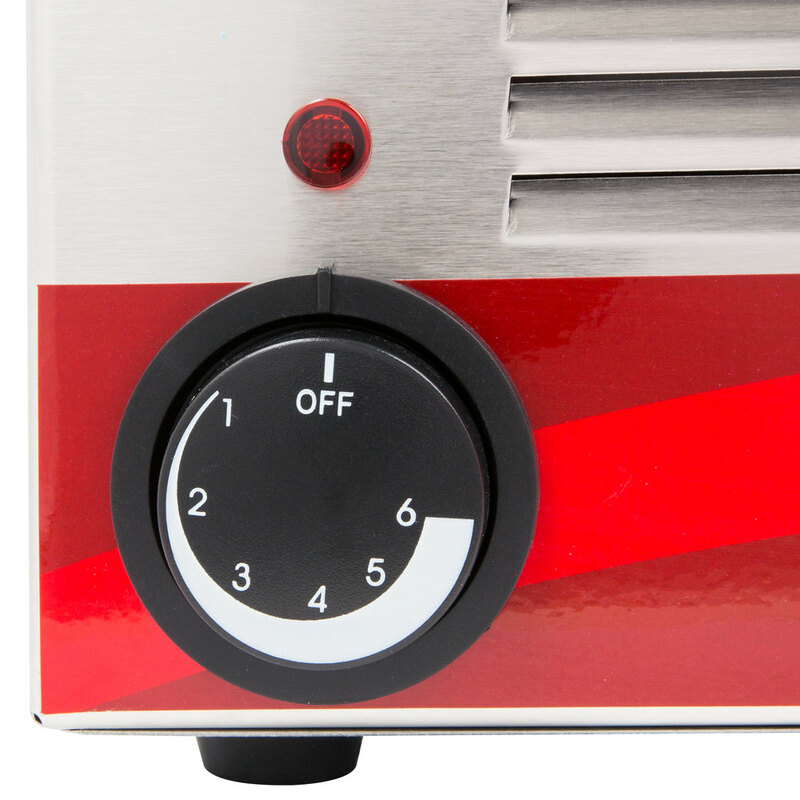 The units work as advertised, are easy to clean, and keep the foods heated to a perfect temperature. We have found that the dial settings accurately represent temperatures. Great electric steam table, but be very careful , you cannot plug two together on the same circuit or you will pop the breaker. But these things are surely the ticket to quick warm food set up. Keeps for at a perfect temperature. Easy to clean. The only thing I would change is when you shut it off the red light would go off. 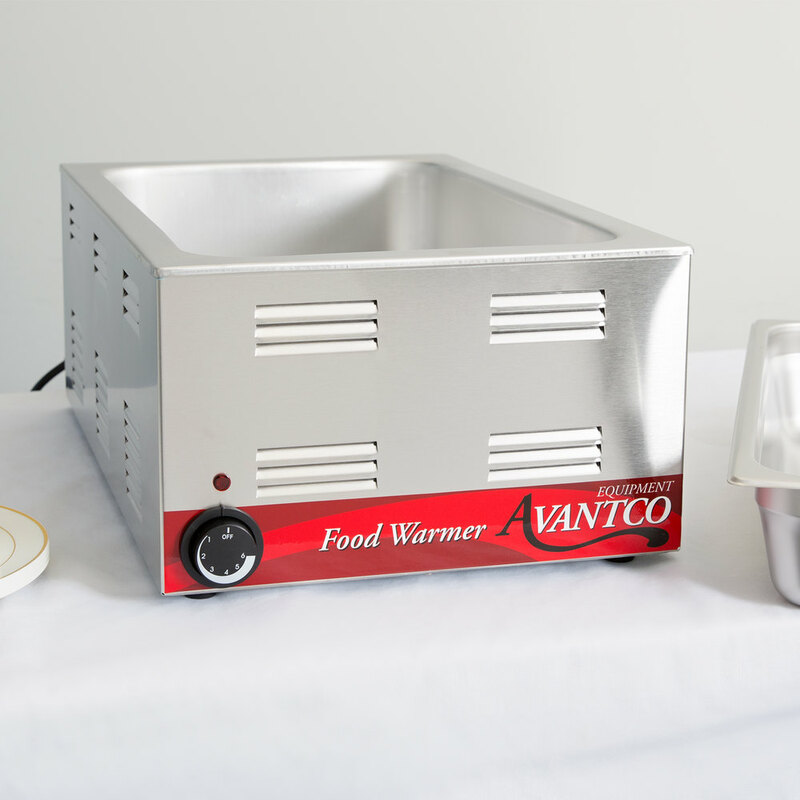 The avantco w50 12 by 20 full electric coumtertop food warmer 120v 1200w works well. I haven't had any issues with it and it is worth the price paid. I’ve had two of these warmers for four seasons of a farmers market and both are still operating perfectly. Excellent value, will definitely purchase this brand again. When opening our new location we were considering a buying a full sized steam table but as costs added up I decided to go with 3 of these instead. I am very happy with the warmers and have not had an issue with any of them. They are on 7 days a week for an average of 12 hours a day.